As much as I love Kate Spade, the prices don't always work for my budget. However, Kate Spade earrings always "seem" reasonable when compared to the shoes and handbags I've been coveting. At $40-60 minimum though, they still really are expensive earrings. As much as I love a good pair of Kate Spade earrings, I will only buy them if I catch them on sale. During some recent trips to Target, I could not help but notice a couple of great Kate Spade looks for less in the jewelry department. I snagged the pink stud earrings below for myself and recently received the same pair in turquoise from my friend Bethany at Perfectly Coutured. These studs are the perfect Kate Spade look for less! I have noticed a few other great options over the past few weeks, so I got inspired to put them all together. You can purchase every look for less item below for a whopping $28 - less than the price of ONE pair of Kate Spade earrings! So, how cute are those sunglasses studs?! Perfect for summer! Choosing the look for less is definitely a pro vs. con situation. For the above earrings, I would definitely choose to buy all of the looks for less and save my money to splurge on something else. However, I would never give up my Kate Spade All Wrapped Up Pavé Stud Earrings...but that's just me. Let me know what you think of the Kate Spade looks for less above! Cute finds! Love Kate Spade!! oh my gosh! great great post! 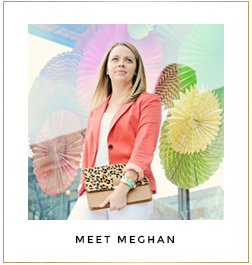 Meghan, I LOVE the look for less finds (all my collection needs are earrings to be complete... so, PERFECT!) & holy AWESOME Giveaway, I'm excited to be inspired from the fellow bloggers !!! You already know that I love look for less finds! And so glad that you like your new earrings :) I'm thinking I might have to get one of the bow pairs! Great finds Meghan!! I have been eyeing those pink bows for awhile now! I do agree that KS earrings are the more affordable KS option, but sometimes ya gotta make the steal! Awesome finds!! I love Forever 21's jewelry, they're always so cheap but cute!! I LOVE the sunglasses! I don't usually wear anything more than stud earrings and that makes all these choices perfect for me!! Thaaaaanks! Love all the bow earrings!